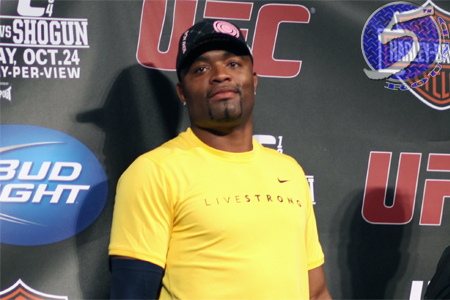 To the surprise of no one this side of Stockton, Cali, UFC president Dana White vehemently shot down the notion of Nick Diaz, who is currently serving a year-long marijuana suspension and coming off a loss for the interim welterweight title to Carlos Condit, challenging middleweight king Anderson Silva (Pictured) for his crown. “Nick Diaz makes no sense,” White stated following Thursday’s press conference. “I know that sounds fun, ‘Yeah! Throw Nick Diaz in there!’ If you really look at the thing, Nick Diaz just lost to Condit at 170 [pounds], so that gives him the opportunity to move up to 85 and fight the pound-for-pound best fighter in the world? Well, it doesn’t. However, the fans seemed to love the idea when Diaz’s longtime manager, Cesar Gracie, suggested the tango to the Twitter universe. In more a feasible superfight, White hinted the organization is eying a blockbuster bout between “The Spider” and welterweight champ Georges St-Pierre. The scrap would undoubtedly mark the biggest fight in mixed martial arts history. “Georges St-Pierre and Anderson Silva are both considered, and most people argue, I think finally, especially with the inactivity from GSP, that people now consider Anderson Silva the [best] pound-for-pound,” White said. “But there was an argument there for a long time, and if GSP hadn’t been this inactive, maybe the debate would still be there. But [St-Pierre’s] definitely two or three in the world, depending on who you ask. And if you were really going to make a fight like that, it would make more sense with Georges St-Pierre than it would with Diaz. White echoed the same sentiment. Assuming St-Pierre’s surgically repaired right knee cooperates, he’ll look to unify the 170-pound crown against Condit at UFC 154 on November 17th.